The Leatherback Sea Turtle, who is also called the Lute Turtle, is a reptile that is currently on the U.S. Federal Governments list of endangered animals. This animals habitat is the open ocean, where it lives and breeds. Unique features such as its constant state of activity and its ability to reach greater depths than most other marine animals when diving are what make this turtle so interesting. The facts listed below provide information on topics such as feeding, predators, and reproduction in addition to reasons why the Leatherback Sea Turtle is endangered. This information is written for both kids nd adults. Click here for a great selection of Amazon.com books about Leatherback Sea Turtles. It belongs to the genus Dermochelys and is the only living member left. Although the Leatherback can be found in open oceans throughout the globe, the Atlantic, the western Pacific and the eastern Pacific Oceans are home to three separate population groups. Leatherbacks are able to maintain high body temperatures, even in cold water, through endothermy, a metabolic process that generates heat. Their diet consists almost entirely of jellyfish and a few other oceanic organisms. They even travel across the Pacific Ocean in search of jellyfish. Human pollution is the major cause of the Leatherback Sea Turtle being an endangered animal. Plastic bags and balloons are left floating in the ocean and the turtles ingest them, mistaking them for Jellyfish. This often leads to death. Egg poaching and entanglement in fishing nets are additional reasons for the decline in this species population. Dives as deep as 4,200 feet (1,280 meters) under water have been documented, making the Leatherback Sea Turtle one of the deepest diving animals in the marine world. The Leatherback Sea Turtle made it into the Guinness Book of World Records for being one of the quickest reptiles on record. In the water, it can reach speeds of 35.28 Kilometers per hour (21.92 mph). Females mate every couple of years. Mating takes place in the ocean, but nesting takes place on the shore. Predators of Leatherback eggs are numerous. Ghost crabs, raccoons, lizards, dogs, coyotes, and mongooses are just some of the land animals that feed on the eggs. Ariel predators include plovers and gulls. The lucky turtles that are able to hatch have another obstacle to overcome. The same predators will try to catch them as they travel from the beaches where they are born, to the ocean. Once in the water, the Leatherback will aggressively defend itself, but still faces predators such as a variety of sharks, large fish, and orcas. The Leatherback Sea Turtle is the largest living turtle. In fact, the largest Leatherback on record is a male who weighed in at 2,019 pounds (916 kg). 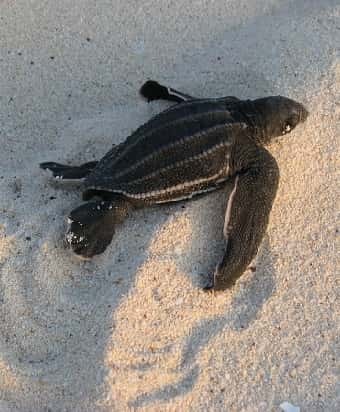 The Leatherback Sea Turtles body is elongated, in the shape of a teardrop and differs from other sea turtles in that it does not have a bony shell. The upper area of the shell, or carapace, contains a rubbery layer of skin and oily flesh. The front flippers are claw less and enable the turtle to swim quickly through water. Adult flippers can reach over 8 feet long (270 cm). The shell is either black or grey with light colored spots and contains seven distinct ridges that run horizontally along the turtles shell. The Leatherback Sea Turtle has no teeth but instead has downward facing bony spines that tear up the food before it is swallowed.